HySCO is an academic software for the correction of susceptibility artifacts in diffusion weighted images based on a reversed gradient based acquisition scheme. It is developed by Lars Ruthotto and Jan Modersitzki as an add-on to the registration toolbox FAIR. HySCO requires the acquisition of a pair of images with reversed phase-encoding gradients that are oppositely affected by distortions. From the so-called "blip-up" and "blip-down" image data, HySCO estimates the field-inhomogeneity by solving a tailored image registration problem that incorporates a physical model of inhomogeneity artifacts in spin-echo MRI. HySCO's name-giving component is a special nonlinear regularization functional, which is inspired by hyperelasticity. It ensures smoothness of the field inhomogeneity and invertibility of the geometrical transformations regardless of the actual choice of regularization parameters. Use EC and Motion Correction to minimise eddy current and motion artefacts for each diffusion dataset separately (i.e. for blip-up and blip-down). The EC and motion corrected images will have a prefix 'r'. Reference blip-up image: Select one reference image volume acquired with blip-up phase encoding direction (b=0 image is recommended, because it has higher SNR). Note that the ''true'' blip-up and down directions can be unknown! Just define here one DTI dataset as ''blip-up'' and the other as 'blip-down'. The field inhomogeneity is estimated by minimizing the sum-of-squared difference between this image and the blip-down image chosen below and regularization. Reference blip-down image: Select one reference image volume acquired with blip-down phase encoding direction (see above for details). 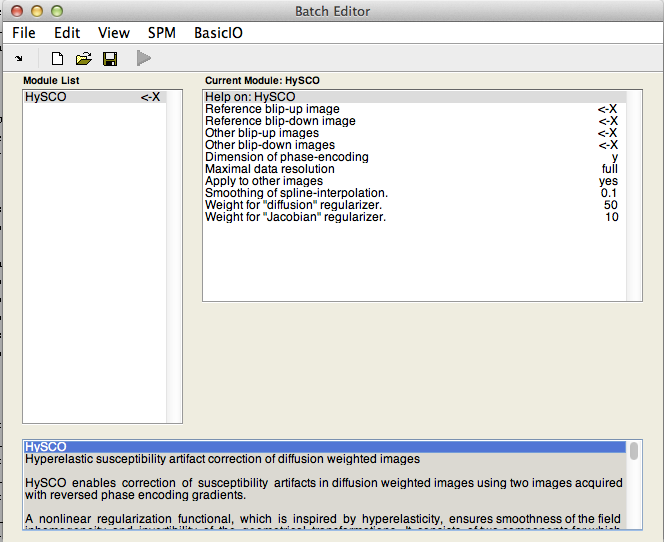 Other blip-up images: (optional) Choose ''other image volumes'' acquired with blip-up phase encoding direction. The data is corrected by applying the transformation estimated by the reference blip-up/down data. If an equal number of blip-up and blip-down data is provided as ''other image volumes'', you may also want to disable ''Apply to other images'' (see 7). Other blip-down images: (optional) Choose ''other image volumes'' acquired with blip-down phase encoding direction. Dimension of phase-encoding: Specify the phase-encoding direction of your data (i.e. the direction in which the susceptibility distortions will be greatest). Default is y-direction. Maximal data resolution: Choose the finest discretization level for field inhomogeneity estimation. If set to ''full'' a multi-level strategy with three discretization levels is used, where the resolution on the finest level equals the data resolution. To save computation time, choose ''half''. The multi-level scheme will be stopped after the second level (i.e. half of data resolution) and the inhomogeneity estimate will be interpolated to the data resolution. Apply to other images: If set to ''no'' and if the same number of diffusion-weighted images is provided for blip-up and blip-down, the field inhomogeneities are estimated for each set of blip-up/down images separately (This might be useful to correct in addition to susceptibility-induced distortion for the distortions due to nonlinear eddy current fields). To this end, the field-inhomogeneity estimated from the non-diffusion weighted images is used as a starting guess for minimization of the distance between the respective diffusion-weighted image pairs. Optimization is only carried out on the finest discretization level to save computation time. Smoothing of spline-interpolation: Choose parameter theta that balances between the data fit and the smoothness of the cubic B-spline approximation of the image data. For theta equal to zero a standard cubic B-spline interpolation is used. For positive theta data is only approximated, but the image representation is smoother. Thus, theta can be used to adjust for noise level of the data. Note that this scheme is only used for the optimization and in particular that the corrected image data is obtained by resampling using a standard tri-linear interpolation. For details see Section 3.4 in: Modersitzki, J. FAIR: Flexible Algorithms for Image Registration. Society for Industrial and Applied Mathematics (SIAM); 2009. Weight for "diffusion" regularizer: For larger values of alpha, the computed solution will in general be smoother, but the image distance between the corrected blip-up and blip-down image will be larger. Weight for "Jacobian" regularizer: By design the value of this regularization functional grows to infinity when the Jacobian determinant of either of the geometrical transformations approaches zero. Thus, for larger/smaller values of beta, the range of the Jacobian determinants, which translates to the maximum compression/expansion of volume, becomes smaller/larger. However, for any beta that is greater than zero both transformations will be invertible. Recommended pipeline for DTI data that suffer from signal-dropout artifacts due to patient table vibration. Example for 'Write HySCO corrected images'. Ruthotto, L, Kugel, H, Olesch, J, Fischer, B, Modersitzki, J, Burger, M, and Wolters, C H. Diffeomorphic Susceptibility Artefact Correction of Diffusion-Weighted Magnetic Resonance Images. Physics in Medicine and Biology, 57(18), 5715-5731; 2012. Ruthotto, L, Mohammadi, S, Heck, C, Modersitzki, J, and Weiskopf, N. HySCO - Hyperelastic Susceptibility Artifact Correction of DTI in SPM. Presented at the Bildverarbeitung fuer die Medizin 2013.